But does Buffered back up their assertion? I grabbed a premium subscription ($7.62/mo at the time of purchase) from Buffered.com and downloaded the Windows app to find out. 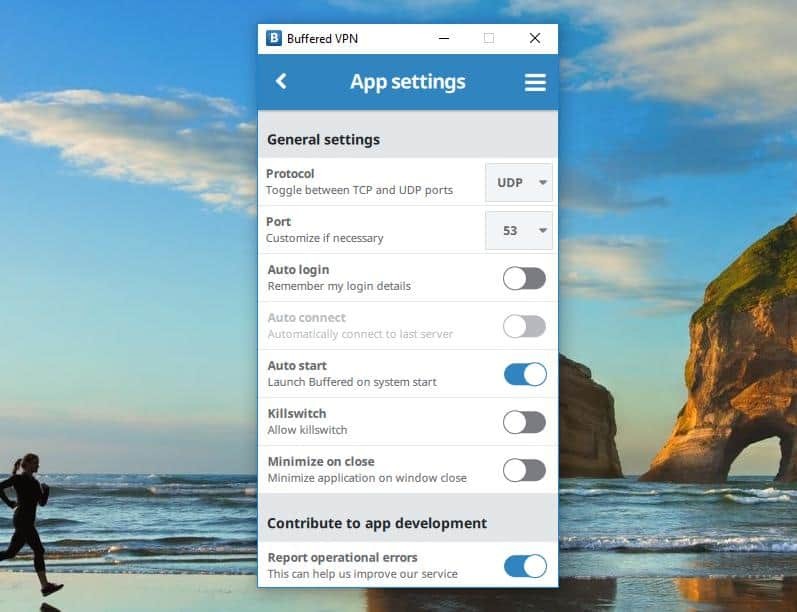 Buffered’s Windows app is very easy to use—just fire it up, choose from one of 37 different servers around the world, and you’ll be connected automatically. Once you’re connected, you can see speed measurements and your VPN IP address. You can also rate the quality of your connection to provide feedback to Buffered on how well it’s working. The app’s settings are very basic; you can switch back and forth between TCP and UDP, choose a custom port for the VPN, and toggle things like launch-on-startup and whether or not the VPN killswitch is allowed. You can also tell Buffered whether or not you’re willing to share statistics on operational errors. There’s not a whole lot of customization available here, but if you’re not an advanced VPN user, this isn’t likely to be a problem. The mobile app, however, isn’t quite as simple. You’ll need to download the OpenVPN app, then go to Buffered.com and download the configuration files for a specific server. If you want the option of connecting to multiple servers, you can download multiple configuration files. It’s not much of a hassle, but it’s not as easy as some of the other mobile VPNs we’ve reviewed. Buffered advertises itself as “Made with [love] in Gibraltar,” (similar to iVPN) but their headquarters is actually in Hungary. Gibraltar is a British Overseas Territory, which worries some people. The UK is part of a large intelligence-sharing agreement with the United States, and data privacy laws in both countries aren’t very reassuring. Buffered addresses this with a page on the legal status and jurisdiction of Gibraltar, where they assure users that they aren’t required to share any information with the government of Gibraltar. However, I should point out that That One Privacy Site did some research into the sovereignty of Gibraltar, which is a British Overseas Territory, and pointed out that there might be under more British control than it at first appears. To make the whole situation slightly more complicated, Buffered’s data is actually stored in the Netherlands. Hey there, physically all of the user data is stored in Netherlands, and legally Gibraltar guards it. It’s unclear exactly what “legally Gibraltar guards it” would entail. But the Netherlands is part of an intelligence-sharing scheme that includes the US and the UK. Despite that, the country does have some solid privacy-protecting laws in place. If you’re absolutely committed to avoiding VPNs based in countries that share intelligence, you may want to avoid Buffered. If you’re not too worried about it, their Gibraltar/Netherlands base probably isn’t cause for concern. To make sure Buffered was providing the security it promised, I ran an extended DNS leak test using IVPN’s online tool. As you can see, the tool showed no indication that there’s any DNS information leaking from Buffered. That’s an important test to pass, as a DNS leak can give away more information about you than you might expect. It’s also worth noting that each of Buffered’s servers has a DNS server hosted on it, so you’ll always have fast access to a DNS. When it comes to VPN features, Buffered is fairly bare-bones. The VPN uses 256-bit Blowfish encryption, which is a military-grade standard. It also uses the OpenVPN protocol, which is widely recognized as very secure. So from a security standpoint, Buffered is solid. There’s nothing here that stands out as especially awesome (like NordVPN’s double encryption), but there’s also nothing to worry about. Buffered promises 24/7 customer service, and that’s a big plus in my book. In addition to live chat on their website, they also have a ticket-submission system that’s always monitored. They promise they’ll get back to you in a few minutes. When I asked about the details of which protocols the VPN uses via email, I got an answer in about 10 minutes. Buffered is also very active on Twitter, but because live chat is always available, you probably won’t need to tweet your support questions at them. A subscription to Buffered gives you the option to run five simultaneous connections. This is great for anyone looking to protect their family or use multiple devices at once. You can also install Buffered on your router to run everything in your house through the VPN. Buffered works with both DD-WRT and Tomato routers. So while it’s on the higher-priced side, you can get your money’s worth if you run numerous connections. When I tested Buffered with Netflix, the US West Coast server was able to successfully connect. So if you’re based elsewhere (or just traveling), you’ll be able to watch your favorite shows from home. Servers in other countries, however, weren’t able to open up Netflix. If you want to watch something that’s not available in the US Netflix catalog, you’ll have to find another way. And Buffered is completely torrent-friendly. They don’t restrict any P2P file-sharing applications on their network, so you can torrent to your heart’s content. You may want to opt for a VPN that’s a bit faster, though, if you plan on torrenting a lot. If you’re connected to a VPN, and your connection is severed, your traffic will immediately start going out over your unprotected connection—but a killswitch solves this problem. If your VPN connection is severed, all internet traffic on your machine will stop. It’s a pain if you’re downloading or streaming something, but it ensures that you’re protected no matter what happens to your connection. Buffered’s kill-switch is off by default, but I recommend turning it on in the settings right away. Buffered doesn’t make its logging policy super easy to find, but if you do some digging, you’ll find the answers on their site. If you are an existing customer, we (or third parties on our behalf) will only contact you by electronic means (e-mail or electronic chat) with information about goods and services similar to those which were the subject of a previous sale or negotiations of a sale to you. You may opt out from receiving such information at any time by letting us know. So Buffered’s logging policy is pretty good. But there’s a possibility that some of your information will be provided to third parties, which may turn some people off. Of course, speed is the primary factor that a lot of people are interested in when it comes to a VPN. Buffered says that it’s the fastest VPN—let’s see if they’re right. Although Buffered boasts a highly secure AES-256 encryption, I found myself entirely underwhelmed by their server speeds (especially when you take the price tag into account). Remember what they claimed to be? “Fastest and most secure VPN”. Sadly, not true. As always, take speed tests with a grain of salt as they rely on many different variables, such as: Your network connection, your location, your computer and so on. However, since we’ve tested 70+ VPN services so far, we have an average that available which we can compare. Buffered is far from a “slow” VPN. In fact, out of the 70+ VPNs that have been reviewed on this site, they are the 9th fastest. Out of the 8 VPNs that have faster download speed, only one of them is more expensive. In fact, several of these VPNs boast speeds that are 40% faster than Buffered for less than $4 a month. However, Buffered does offer quite a few impressive features and bonuses to help make up for their lackadaisical speed and overpriced plans. While $4.12 per month is very reasonable, Buffered is never going to make it into a list of the cheapest VPNs. That’s way more expensive than my recommended VPNs such as Surfshark ($1.99/mo when reviewed) and NordVPN ($2.99/mo when reviewed). If someone registers for premium service using your referral link, you both get 30 free days of service. So that can add up if you’re able to get a lot of people to sign up. Buffered also offers a 30-day money-back guarantee on all their plans. Ease of the VPN software: VERY simple and easy to use. Hidden fees & clauses: Refund will be only made if you haven’t exceeded 100 sessions (or 10 hours of sessions) or 10GB of bandwidth. Instant access after payment: Yes. Server park: 37 servers worldwide. All in all, Buffered is a solid choice for a VPN. It uses industry-standard security technology, has a strong no-logging policy, and offers great customer support. And there aren’t very many cons; their confusing legal status might throw some people off, using the service on mobile is a bit more arcane than other VPNs, and the speed probably isn’t enough for serious torrenting. Those really aren’t too bad. In the end, we’d recommend choosing another VPN from the top of our best VPN review list. If you have a specific reason for wanting to use Buffered, though, I won’t say it’s a bad choice. Solid service and a great user experience! I know a little about computing, but I wouldn’t call myself an expert. So, the process of setting up a VPN was a little daunting and contained an element of risk. That said, my experience with Buffered was straightforward and presented no risk. My user experience was good too! The service was easy to set up and manage. The customer service has always been speedy and efficient too! I highly recommend them! I have been with Buffered for almost 4 years now. I have them set up on my Asus ac88u. The Buffered service is so simple to set up in this router that even a child could do it. I had Buffered on another router that worked with them just as well. Before I had the Buffered vpn service controlled through our router I use to have Buffered hooked up through our 2 computers which was just as good however I like them hooked up through the router that way the tv and all of our computers are connected through one device. Now about Buffered I have a plan with my internet company where I get 15Mpbs and I have disconnected the Buffered vpn service to see if my speeds were the same and trust me not one Mpbs was lost. I have tried all kinds of speed tests and they are all showing the same. I have a Amazon Fire Tv with Kodi downloaded and Buffered works excellent with this as well. Buffered uses a Military grade encryption that is very very good and nothing or nobody can get into it or neither does it have any leaks. I have done all kinds of tests and it checks out very well. Buffered says they do not keep any logs for more than I a few weeks and I trust them. Even if they did keep logs as long as you are not doing anything illegal what do you have to worry about? I plan to stay on with them for as long as I am living and I can say this that they are getting more countries added to their list all the time. Give them a chance and you will not be disappointed I can guarantee this. Stay safe and get protected now. Give Buffered a try. Needed something easy to use for my wife and kids. Primarily wanted privacy/security on free WiFi and to get around throttling and blocking that I was experiencing. Have had some minor issues with Hulu recognizing VPN, but honestly more inclined to drop Hulu as a service. Ajit Pai is in the pocket of telecoms and VPNs. The VPN is average and leaks but the customer service worse. Please be careful using this service. If you missing cancelling your renewal by even a day they will not refund. Company hides behind T&Cs as justification for really poor customer service. Today, on June 4th I tried again to cancel my account. However, it turns out my son had his email on the account so I didn't get the email warning. I am a very unhappy customer. I would pro-rate the refund if I was them. Note how Alex D. keeps dodging my answers. Buffered has everything you need for VPNing: quick speeds and good usability. The only thing that is problematic is their price. I’m a month-to-month user and I’m paying around $9/mo which is a lot compared with many others. Though, I’m not worried about it too much since the product itself is really good and I’ve had no problems so far.